One of the UK's major toilet tissue importers has been stockpiling to ensure it can maintain supplies in the event of a no-deal Brexit. Last week, Morrisons' chief executive said the supermarket had seen an increase in demand for toilet paper. Speaking to Radio Five Live's Wake up to Money podcast, David Potts speculated it might be related to people stockpiling goods ahead of the end of the March deadline for the UK to leave the EU. Wepa sells toilet paper and kitchen roll which used by retailers for their own-brand products. Customers include Lidl, Morrisons, Sainsbury's, and Tesco. In October last year, former Europe minister Denis McShane highlighted Britain's dependence on toilet roll imports in an article he wrote for Prospect Magazine. 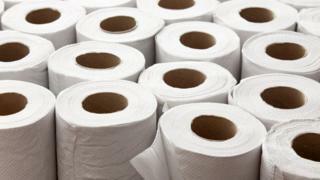 Mr McShane said that the UK was Europe's biggest importer of loo paper, and that Britons use two-and-a-half the European average number of rolls per year. Last week, Morrisons' Mr Potts said that the retailer had seen a "small amount" of stockpiling affecting sales. "We've seen quite a tick-up in [sales of] painkillers and toilet rolls," Mr Potts said. "Whether that has any bearing on how people are feeling about Brexit, I don't know." Video Could no-deal Brexit lead to loo roll logjam?